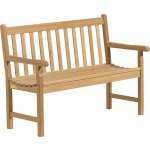 Outdoor Furniture & Park Equipment: Enjoy Our Selection! Whether you are arranging a new school playground or enhancing the courtyard of your building, Hertz Furniture has the outdoor furniture and park equipment you need. Where should you put picnic benches and garbage cans? Make sure that you balance aesthetics with practical considerations when arranging attractive outdoor areas. Don&apos;t forget an eye-catching message board to promote awareness for all of the great things you are doing. 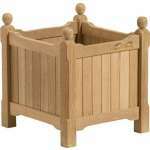 All of our products are constructed from high-quality materials and meet government safety and ADA guidelines. We provide free extended warranties, so you can be sure that your playground equipment will provide many years of safe fun. With this full collection, you can get everything you need in one convenient place. What is the best park equipment? Having lots of things for kids to do at recess will make everyone&apos;s experience more enjoyable. With a large commercial playground equipment, you can provide tons of activities for your students in one sturdy unit. Recess is more than just play, it is an opportunity to get out some energy, socialize and develop motor skills. With plenty of things to climb up, slide down and swing on, all children can benefit from the free time. 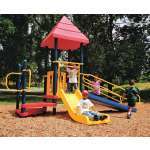 Our park equipment comes in a number of different sizes and styles from Kidstuff Play Systems and UltraPlay. Whether you need equipment for a small private preschool or large public elementary school, we have a number of great models to choose from. Be sure to check the capacity and dimensions of the playgrounds you are considering to ensure that they will fit your student population and physical space. What are the benefits of a school playground? School playgrounds are both fun and educational. As kids enjoy climbing, sliding and exploring, they are actually developing important life skills. Problem-solving, gross-motor skills, coordination and teamwork can all be developed as children swing, glide and challenge themselves. With the right kind of playground set, your students will have so much fun, they won’t even realize how critical their movements are to their own development. While children are at play, supervisors need a place to watch them from. Recess is not a break for teachers, they need to keep an eye on the children, but that doesn&apos;t mean they have to be standing or sitting in an uncomfortable place. A few durable outdoor benches placed in close proximity to play equipment will provide educators with an appropriate place to sit and supervise. Children might also appreciate having a place to sit down and take a break from all of the action. Great outdoor seating can also add a lot to the experience of sports teams. 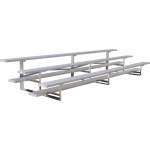 Long team benches will fit well in the dugout or on the sidelines of the soccer field. Student athletes will enjoy sitting on the sidelines and cheering on their teammates as they prepare to get in the game and contribute as well. What should I look for in a picnic table? Help your students enjoy the beautiful weather and offer an alternative to the indoor cafeteria with UltraPlay picnic tables. Vibrant colors and a selection of shapes can create an attractive configuration for any space. 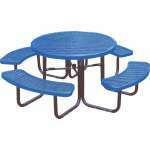 These durable picnic benches are built to withstand the elements with high-tech thermoplastic coating that will keep them looking like new through many years of use and enjoyment. Do I need trash cans on the playground? Having proper waste receptacles is important for every eating area and playground, that’s why you definitely need to include them in your outdoor furniture. If there are no trash cans around, people are likely to leave garbage on play equipment or picnic tables, rather than carrying it around in search of a proper place to dispose of it. Well-placed garbage cans encourage students and employees to clean up after themselves, so your cleaning staff won&apos;t have to do extra work. 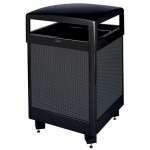 Garbage bins are available in a selection of colors and styles. Bright hues can be matched to play grounds for a coordinated space. In a professional setting, subdued shades that blend in with the surroundings will provide proper waste disposal without detracting from manicured gardens or elegant courtyards. How can I go green at school? 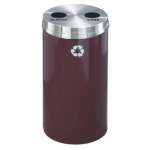 When considering the waste disposal options, every eco-friendly company and school needs recycle bins. They can be placed right next to trash cans so no one even has to go out of their way to recycle. Promoting environmentally-friendly initiatives teaches students that it&apos;s not hard to be green at school -- or anywhere else. Glaro recycling cans are convenient for students and the maintenance staff who empties out waste receptacles because they keep materials organized and properly sorted. What is the best way to promote an event? With great outdoor furniture and equipment from Hertz Furniture, you can host lots of exciting events in your school or church. 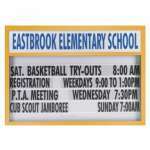 To promote your event and ensure that the community stays informed about upcoming holiday parties, assemblies and more, use our wide selection of enclosed bulletin boards and outdoor message boards. With a cork board or letter board in the front of the building, you can easily display messages to passerby. This will keep all members and potential newcomers informed about the exciting programming that you have planned. To make messages even more prominent, consider a model with illumination or a custom header. At Hertz Furniture, we have all of the outdoor furniture and park equipment you need to furnish playgrounds, courtyards, picnic areas and more. With the right furniture around your outdoor areas, students and employees will just love spending breaks outside and getting energized for the rest of the day.